Hahahahaha Been there, done that! Never had to go that far. Into everything I bet. Oh – oh trouble is about!! Todderling curiosity makes you see the world in a completely different way. Love the photo. Haha I think I have got all this to come. I can’t believe you have to tape over the dials how funny! Love it! Looks like our cupboards! What a good idea! 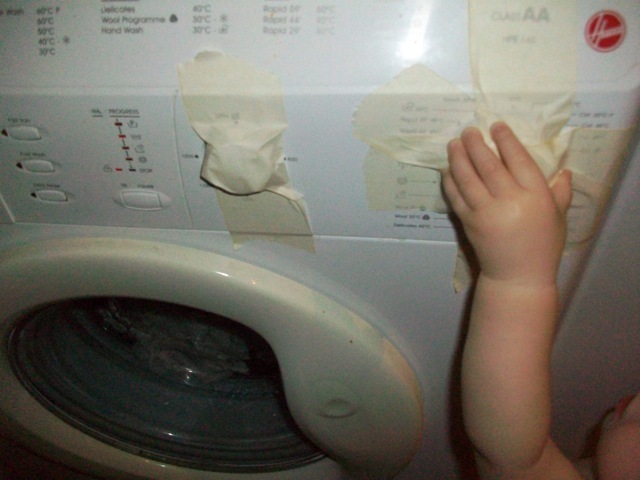 If I had a pound for everytime my daughter had turned the washing mashine on with nothing in it, I could probably afford a new washing mashine! Brilliant plan…those little fingers look like they’re inquisitive! Why are the so fasinated with washing machines? My daughter set mine to a 90 wash without me realising and ruined an expensive cardi of her’s. Great idea though! What a good idea. We need to do something like this for our dishwasher. Great Idea and shouldn’t leave any marks either when its taken off. A much cheaper Idea that getting cupboards built to surround your appliances. But most of all I love the look of that little arm! Rofl, did it work??? My little ones are a nightmare with the washer.